young living Essential oils for kids! Kiss the common concerns of childhood better with natural essential oil solutions that you can feel good about. The oils in the KidScents® Oil Collection are mild essential oil blends prepared especially for kids… no dilution necessary! These blends have already been diluted with coconut oil and are ready to use straight out of the bottle, which any mom applying oils to a wiggly child knows is a great benefit. The kit also comes with 2 roller ball tops, suggested for the TummyGize and Owie blend for easy application. The kit comes in a plastic zippered case, so it will be easy to throw in a diaper bag or purse. The ready to use oils (a.k.a. no dilution required!) 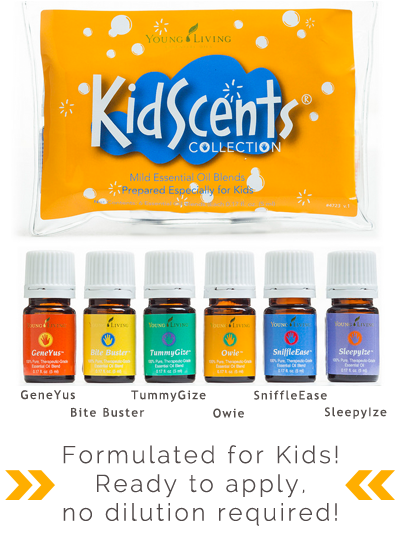 make them a cinch to use – I am thrilled about the new KidScents® Oil Collection! What a great addition to the Young Living product line!! With the Young Living KidScents® Oil Collection, parents can safely and effectively navigate children through childhood to become healthy and happy adults. Click here to see what's in these blends. You can get this kit and all other products at 24% below retail cost when you become a wholesale member! 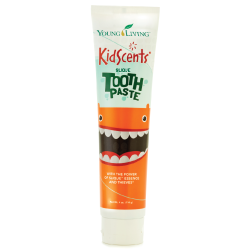 This formula is an all-natural toothpaste for kids that uses Thieves® and Slique™ Essence essential oil blends to gently clean and protect teeth. This safe, yet effective, blend promotes healthy teeth without the use of fluoride, dyes, synthetic colors, artificial flavors, or preservatives. KidScents® MightyZyme is an all-natural, vegetarian product in the form of chewable tablets designed to help children combat the negative effects of enzyme depletion. MightyZyme chewables address each of the digestive needs of growing bodies and assist normal digestion of all foods, including proteins, carbohydrates, and fats.